In anticipation of an eventual political transition in Cuba, two Cuban-American engineering organizations in South Florida, the Cuban-American Association of Civil Engineers (C-AACE) and the Association of Cuban Engineers (ACE) have joined forces to create a Cuba Water and Wastewater Infrastructure Committee. This committee has begun to gather information and identify issues so that it may assist in an advisory capacity, if and when requested, in the planning and execution of infrastructure improvements. Many of the issues involve close collaboration between engineers and economists. This paper begins with a description of Cuba’s legal and institutional framework for the water and wastewater sector, with emphasis on the National Institute for Water Resources. It continues with a discussion of service delivery modes, which include some privatized operations. Next is a discussion of the water and wastewater infrastructure, with a focus on the City of Havana, for which there is generally more information than for the rest of the island. This infrastructure discussion follows the sequence of the hydrologic cycle, namely: water source, water treatment, water distribution, wastewater collection, wastewater treatment and wastewater effluent disposal. Next is a discussion of some institutional and economics issues, including lessons learned from other countries. The last section consists of a summary and recommendations. Cuba is divided administratively into 14 provinces, with a total population of 11.5 million. The capital, Havana, with a population of 2.2 million, is located on the northern coast of the western portion of the island. The city is the political, administrative, economic and cultural center of the country. The city is characterized by a total area of 730 km2 of which 560 km2 is urbanized resulting in an urban density of about 4000 inhabitants per km2 (Alonso Hernández and Mon, 1996). The responsibility for providing water and wastewater service in Cuba lies with the National Institute for Water Resources (Belt and Velazquez, 2007), which currently is a part of the Ministry of Construction. As gleaned from a review of Cuban laws, the framework under which the Institute works is shown in Figure 1. The overarching responsibility for planning lies with the Ministry of Economy and Planning, and thus it provides overall direction to the Institute’s goals. The Ministry of Science, Technology and Environment provides the environmental standards that the Institute must meet. The Institute provides monitoring data to the Ministry of Health. What is not clear from the available information is how the utility regulatory function, as carried out in other countries, is handled in Cuba; this is a matter for further research. 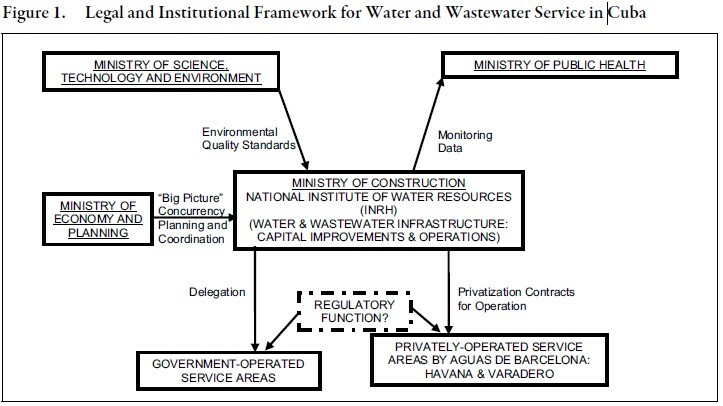 It is noted that for the most part, the Institute self-performs the usual utility services, with the exception of service in the cities of Havana and Varadero, where the Institute has implemented public-private joint ventures with the Spanish-based company Aguas de Barcelona, as is discussed below. As previously stated, for the most part the Institute self-performs its services, but there are two exceptions, as illustrated in Figure 2. As shown in this figure, the Institute has formed public-private joint venture partnerships with the Spanish firm Aguas de Barcelona (Agbar) to manage a portion of the drinking water system in the City of Havana and the tourism resort of Varadero. 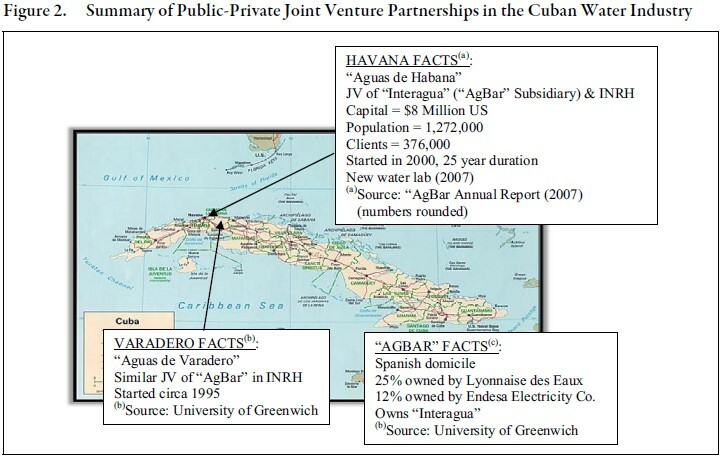 The figure shows some facts about each venture, especially the one for Havana. Also shown are some facts about Agbar, who is a significant player in the world of private water and wastewater operations. According to the website Finanzas.com, Agbar invested 5 million Euros to improve the water distribution system in Havana. According to the same website, the Havana joint venture Aguas de la Habana charges 1 peso per cubic meter to the local population and 1 dollar per cubic meter to the tourist or visitor population. Aguas de la Habana pumps 330 million cubic meters of water per year, of which only one-half reaches the end users due to leaks in the distribution system. 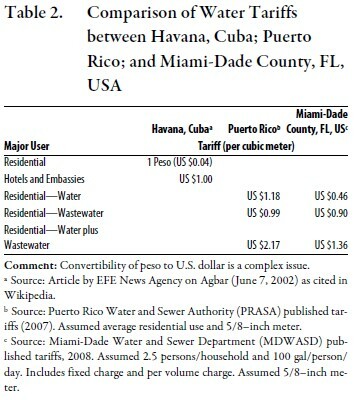 In comparison to other countries, Cuba tends to perform slightly below in terms of access to water (Table 1). According to the Pan American Health Organization (PAHO) (2000), about 74% of the population in Cuba had access to a household connection for potable water. Comparison countries had slightly higher access percentages, namely 80% access for the Dominican Republic and upwards of 90% for Chile and Costa Rica. Most comparison countries report 100% disinfection of their water supplies, whereas 84% is reported for Cuba. With respect to wastewater, accomplishment indicators were more variable, with values for Cuba (38% served by a wastewater collection system and 19% treatment of the wastewater collected) within the range observed for other countries. With respect to overall sanitation coverage (sum of wastewater collection plus on-site disposal systems), Cuba appears to be performing slightly better (98% improved sanitation coverage) than the comparison countries. 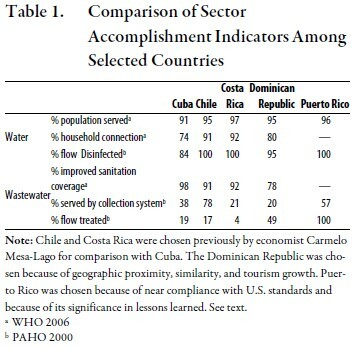 These accomplishment indicators suggest that Cuba may be slightly below or slightly above its comparison nations on some water and wastewater parameters. However, these accomplishment indicators represent a gross assessment of access to water and wastewater and in order to truly understand infrastructure needs for a particular country, an evaluation of the details of the system is necessary. In the following sub-sections, a more thorough assessment is provided in terms of the water treatment cycle, which begins with source water characterization and protection in terms of water quantity and quality. Once the source water is identified, it is then treated and subsequently distributed to the population. An important aspect of the water treatment cycle is to properly capture, treat, and dispose of wastewater which is generated. Wastewater treatment plays a key role in the prevention of contamination and thus its proper disposal plays a key role in source water protection which, in turn, is the first step in protecting drinking water supplies from contamination. As mentioned earlier, the following subsections are split into two parts, the first focusing on the island as a whole and the second focusing on the City of Havana. The climate of the island of Cuba is tropical, characterized by a humid, warm, and wet environment. The monthly average humidity ranges from 79 to 85%. The maximum monthly temperature ranges from 16.7 oC in January to 31.0 oC in August; the yearly mean temperature for the island is 24.5 oC (Alonso Hernández and Mon, 1996). The rainfall for the island is generally high with an overall average for the island of 133 cm per year. The maximum yearly rainfall occurs on the western side of the island (175 to 200 cm per year) and the minimum occurs in the Guantanamo Bay area on the east (71 cm per year) (Chamberlin, 1940). Despite the large amount of yearly rainfall over most of the island, the water resources of Cuba are susceptible to saltwater intrusion. Saltwater intrusion is made possible by two primary factors: (1) the pronounced temporal variability of rainfall which results in exceedingly wet conditions followed by exceedingly dry conditions (the latter of which are detrimental), and (2) the topographic features of the island which promote the rapid loss of rainfall runoff to the sea. The significance of these factors is explained below. In Cuba, most of the rainfall falls during a distinct wet season (May through October) with much lower amounts of rainfall during the dry season (November through April). Due to limitations in storage of rainfall runoff, much of the water available during the wet season is lost to the sea, and is thus unavailable to serve as a barrier to saltwater intrusion. The susceptibility to saltwater intrusion is further exacerbated because of topographic features which result in the rapid drainage of rainwater runoff. Cuba’s elongated shape, coupled with the fact that the rivers are generally oriented perpendicularly to the longitudinal axis of the island, limits the residence time of runoff as it flows towards the sea. In general, rainwater runoff reaches the sea within at most a few hours. The mean length of all major Cuban rivers is only 93 km. The country’s longest and most voluminous river (Cauto River) has a length of 370 km. Two additional rivers (Sagua la Grande and Zaza) are each about 170 km, and all other rivers run for less than 170 km. Due to the short course of the rivers and the rapidity with which rainfall reaches the sea, only a limited amount of rainfall is recharged into underground freshwater aquifers along the way (Díaz- Briquets and Pérez-López, 1993) thereby making the aquifers vulnerable to saltwater intrusion from the coast. The overall rainfall quantity for the island is estimated at 150 billion cubic meters per year (computed from data in Chamberlin, 1940). The total safe yield (i.e., the flow that can be withdrawn annually without depleting the resource) for the island as reported by the Cuban Government has been estimated at 6.5 billion cubic meters per year, of which 63.5% was said to be groundwater (Cereijo, 1992). Water extraction was expected to reach 5.2 billion cubic meters per year in 1980. Scaling this number upwards to reflect the population growth between 1980 and 2008 (U.S. Census Bureau 2008) suggests that water extractions may have reached a value of 6.2 billion cubic meters per year. That is, the water demand for the island is nearing its maximum safe yield supply. Problems associated with saltwater intrusion are likely to continue. Meeting the needs of the population will require additional water storage facilities in localized areas where the demand is the greatest. Additional alternatives could include various water conservation measures, and eventually the reclamation of highly treated wastewater for selective uses. The City of Havana has many small water supplies located along the periphery of the City (Aguada del Cura, Paso Seco, Cuenca Sur, Cosculluela, Ariguanabo, El Rincón, Zarza, Coca y Bacuranao, and El Gato). As in the rest of the island, saltwater has intruded into the drinking water supplies, impacting some of the City’s wellfields (Scarpaci et al., 2002). 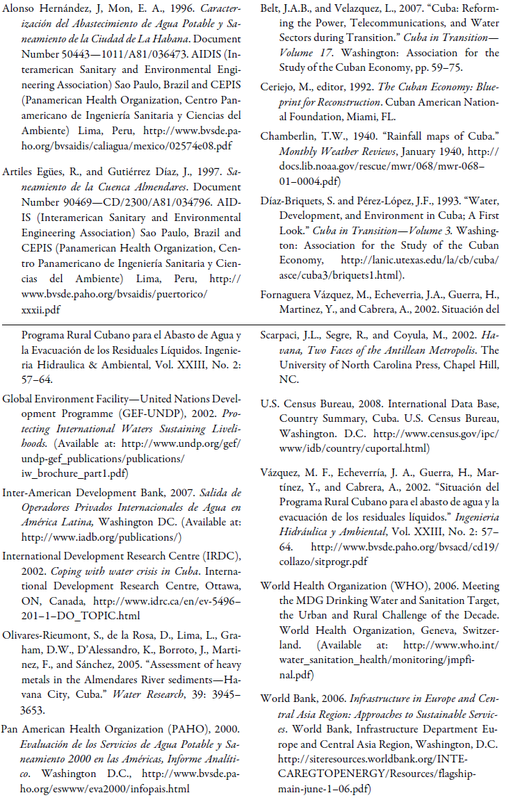 Of the 55 water supplies, 42 are freshwater and 13 are brackish (Alonso Hernández and Mon, 1996). The majority of the water supplies, however, are generally small, with the exception of the contribution from the Vento Aquifer, which supplies 47% of Havana’s drinking water. 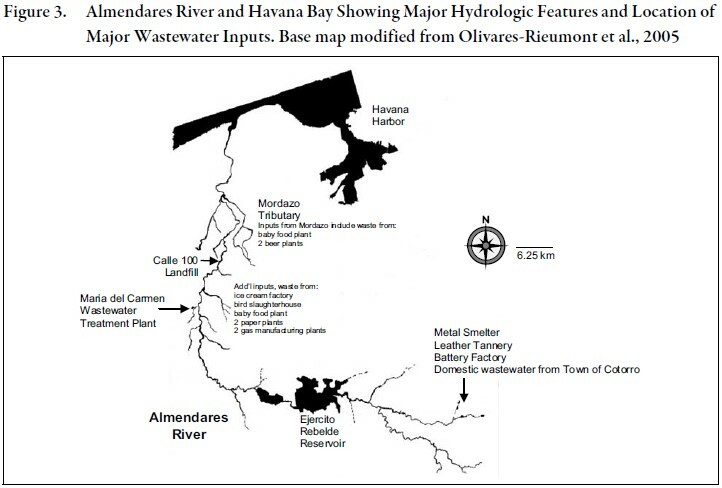 The Vento Aquifer is located below one of the primary river in Havana, the Almendares River (Olivares-Rieumont et al., 2005). The Almendares River, with a length of 50 km and a contributing watershed area of 402 square kilometers, flows from southeast to northwest (Egües and Gutiérrez Díaz, 1997). Contamination of the Almendares River by agricultural runoff, domestic sanitary wastewater, and industrial wastes has been well documented. Of particular concern are discharges from a metal plating factory, a metal smelter (Egües and Gutiérrez Díaz, 1997), a battery manufacturing plant, a leather tannery, and domestic wastewater from the Town of Cotorro (Figure 3) located upstream of the Ejército Rebelde Reservoir (Olivares-Reiumont et al. 2005). This Reservoir cuts into the Vento Aquifer. Because of its depth, the Reservoir can serve as a conduit by which contaminants from upstream areas could adversely impact water quality within the Vento Aquifer. The Almendares River is subject to additional wastewater discharges downstream of the Ejército Rebelde Reservoir, including poorly treated wastewater from the María del Carmen Wastewater Treatment Plant and wastewater from the towns of Calabazar and Las Cañas, plus industrial wastewater from an ice cream factory, a bird slaughter house, a baby food manufacturing plant, two paper plants, two gas manufacturing companies and leachate inputs from a large landfill in Havana (Calle 100 Landfill). All of these inputs lead to the degradation of water quality just upstream of the confluence with the Mordazo tributary. The Almendares River is characterized by low dissolved oxygen levels (between 2 and 3 mg/L, compared to a generally accepted standard of 5 mg/L for sustenance of fish and wildlife), high organic waste contamination (the 5–day biological oxygen demand, known as BOD5, is high, ranging from 30 to 50 mg/L as reported by Egües and Gutiérrez Díaz, 1997), and with significant levels of toxic metals (lead, copper, cadmium, and zinc) (Olivares-Rieumont et al., 2005). The quality of water from the inflowing Mordazo Stream is poor due to domestic wastewater discharges and industrial effluent from two beer manufacturing companies and from a baby food manufacturing plant. After the confluence with the Mordazo Stream, the Almendares River is anaerobic (completely depleted of oxygen), of poor water quality and incapable of supporting aquatic life due to the upstream contamination. The contamination of this river is of concern from a public health point of view because of human health exposures to people who may reside along the banks and along the coastal shoreline where it discharges. Most importantly, the Almendares is a potential hydraulic connection to the primary drinking water supply for the City of Havana, the Vento Aquifer. Treatment of potable water of Cuba is typically focused on chlorination for disinfection. However, some evidence suggests that the water is not reliably chlorinated, partly due to the lack of chlorine. For example, a report by Canada’a International Development Research Centre (2002) indicates that the chlorine plant in the Santiago de Cuba region was no longer operational. In an attempt to improve the quality of drinking water within this region, slow sand filters (an alternative means for treating water, although not a disinfection process per se) were installed within this area. The daily consumption of chlorine in Havana is estimated at 2 and 2.5 tons to obtain a minimum chlorine residual of 0.5 mg/L within the distribution system. Alonso Hernández and Mon (1996) also report that the chlorination equipment at the water treatment plants would benefit from improved maintenance. Given pressure losses of water within the system due to intermittent power supply and lack of back-up generators, water within the distribution system is at risk from contamination due to infiltration of untreated contaminated water during times of low water pressure. As a result many residents are self- treating their water by adding chlorine tablets to it or boiling it. Piped drinking water is available to 72% of the national population. Water is available via public taps or through water trucks to another 21% of the population, suggesting that 93% of the population is served by improved drinking water sources (PAHO, 2000), with 98% access in urban areas and 82% access in rural areas (Vázquez et al., 2002). The remaining 7% of the overall population is without improved water sources. The time of service is also variable. PAHO (2000) reports that 79% of the population has access to an intermittent water supply (average of 12 hours per day). Urban systems with disinfection are estimated at 84% of the total. Water distribution for Havana is separated into 4 systems which include 55 supply centers and 158 pumps, of which 140 are in use and 18 are on reserve. The system also includes 44 lift stations which utilize an additional 101 pumps. The length of the water mains is estimated at 374 km and the length of the distribution network is estimated at 3594 km (Alonso Hernández and Mon, 1996). Eighty percent of the mains and distribution pipes are more than 40 years old, of which an estimated 1800 km are in need of repair. The system lacks metering, which greatly limits the ability to quantify the amount of water transported throughout the system. The system also consists of 13 water storage tanks, of which 9 are in service, with a total capacity of 210,200 m3. The yearly flow volume from the potable water sources is 475,037 hm3 of which 88% is obtained through pumping with an annual energy usage of 111,641 MWh. About 5,700 hm3 per year is extracted from the brackish water sources, resulting in a total water withdrawal of 480,700 hm3 (15.3 m3/s), resulting in an average of 604 liters per person per day (Alonso Hernández and Mon, 1996). About 55% of the water supplied is lost to leaks within the distribution system (Scarpaci et al. 2002). The Central system, which services a population of more than 800,000 people, is subject to the greatest amount of leaks due to the old age of the system and lack of adequate maintenance. Repair of leaks is further hampered throughout the distribution system due to the lack of functioning valves, which makes it impossible to isolate sections of the distribution system for repair. The water supply system is unstable because pumps are in need of repair and because of frequent interruptions in the electrical supply needed to run the pumps. The pumps are in need of surge suppressors and metering systems to assure that they are functioning as expected. Because of the intermittent loss of water pressure and subsequent reinstatement, the system is subject to the so-called Water Hammer phenomenon of vibrations, which accelerates the deterioration of the pipes and junctions. The network is in need of additional water storage capacity and would benefit from increasing the interconnectedness of various sections of the distribution network. Also, metering is needed to document water usage by users, for purposes of charging for the water supplied (Alonso Hernández and Mon, 1996). Of the 11.1 million population, 38% are serviced by connections to wastewater collection systems, 55% with in-situ wastewater systems, and 6% are without service (PAHO, 2000) for a total of 94% sanitary sewerage coverage. Ninety-seven percent of the population has access to wastewater collection facilities in urban areas and 84% have access in rural areas. Among 258 rural communities evaluated, the most common means of collecting wastewater was via sanitary latrines (34% of the communities evaluated) followed by septic wells (10%) and simple wastewater collection networks (3.1%) (Vázquez et al., 2002). Of the 8 wastewater treatment plants on the island, only 4 were believed to be operational (Belt and Velazquez, 2007). PAHO (2000) estimates that 19% of the wastewater collected is treated; untreated wastewater is typically discharged to the closest waterway. The wastewater collection system in Havana is composed of 5 sewer collection networks consisting collectively of 1570 km of sewer lines, 23 pump stations, 2 wastewater treatment plants, and 15 stabilization ponds (Alonso Hernández and Mon, 1996). The wastewater collection network services 55% of the population. The population that is not served by the wastewater collection network include 580,000 served by 116, 500 septic tanks. Furthermore, about 253,800 persons are serviced by small wastewater collection systems whose distribution lines are estimated at 195 km. The remainder of the population discharges wastewater through inadequate means including untreated discharges into nearby rivers and streams (Alonso Hernández and Mon, 1996). The largest of the five wastewater collection networks, the Central network, is over 80 years old and designed for a population of 600,000 although now it is servicing a population of 950,000. The service area covered by the Central network includes the present day neighborhoods of Habana Vieja, Centro Habana, Cerro, Diez de Octubre, Plaza, and the oldest section of Miramar (Scarpaci et al. 2002). The wastewater collected by the Central wastewater collection network treats wastewater through sedimentation. The effluent is discharged via ocean outfall located at Chivo Beach (Playa “El Chivo”). The second of the five wastewater collection networks services a relatively small population of 22,500 and transmits the raw wastewater towards the María del Carmen Wastewater Treatment Plant. This plant, although designed to treat domestic wastewater through primary and secondary treatment, is not operating properly and requires complete rehabilitation (Alonso Hernández and Mon, 1996; Olivares-Rieumont et al. 2005). Wastewater collected from the remaining three wastewater collection networks (lower Almendares, Cotorro and Alamar), servicing a population of 220,000 people collectively, is not treated. Wastewater from these networks is discharged directly to the nearest waterway, including the Almendares River. The Cotorro wastewater collection network, although near a stabilization lagoon, is incapable of transmitting wastewater towards the treatment facility due to an inoperative pumping station (Alonso Hernández and Mon, 1996). In addition to the sanitary sewer systems, waterways in Havana are well known to serve as discharge points for wastewater (GEF-UNDP, 2002). Of note, Havana Bay is known as one of the most contaminated bays within the Caribbean. In addition to receiving untreated domestic wastewater, this bay receives industrial wastewater effluent from four slaughter houses, two thermal power plants, food processing factories, and a paint plant. Additional contamination is added from the Luyanó River which is contaminated with untreated domestic wastewater, oil refinery waste, and gas plant waste (Olivares-Rieumont et al., 2005). The previous discussion clearly indicates that Cuba in general, and the city of Havana in particular, face serious needs for both water and wastewater. To better quantify these needs, engineers usually conduct a gap assessment to determine the infrastructure elements needed, their cost, and their phasing over time. 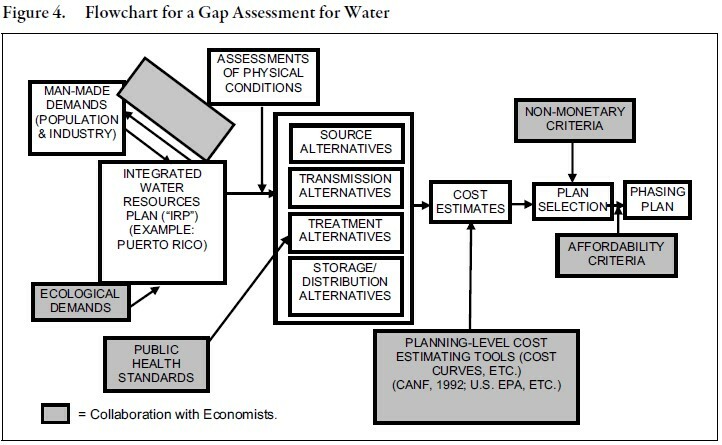 For brevity, we are presenting a flowchart for a gap assessment for water only (Figure 4); a wastewater assessment would be partially dependent on the water assessment and would follow a similar sequence. Based on lessons learned from other countries (to be discussed later), we believe that completing a thorough gap assessment should provide a good foundation upon which to make decisions on service delivery, including the possibility of privatization. As shown, several of the activities should involve close collaboration with economists. We propose that the gap assessment begin with an Integrated Water Resources Plan (to the extent that one may not have already been prepared by the Institute). A possible model might be the plan prepared by the Puerto Rico Department of Natural Resources, and which included both man-made demands (population and industry) and ecological demands. The man-made demands are not fixed, but rather variable, depending on interventions such as conservation incentives and so-called “inclined” tariff structures that increase unit charges as volume increases. Then an assessment of physical conditions would be combined with appropriate public health standards, and with the aforementioned Plan, to lead to an evaluation of alternatives. This evaluation would consider all components of water infrastructure (source, transmission, treatment and storage/distribution) in different combinations of alternatives. Next, the cost (capital and operation and maintenance) of the alternatives would be estimated. For this purpose, there exist preliminary planning-level cost relationships (e.g., cost per foot of pipe as a function of diameter, or cost of a treatment process as a function of daily flow rate) in the U.S. These relationships would need to adapted, with the help of economists, to Cuban conditions such as appropriate currency exchange rates for materials imports, appropriate cost of local labor, etc. Next, an infrastructure plan selection would be determined, taking into account both monetary and nonmonetary criteria. At this point, the input of economists would be needed once more, for the determination of affordability criteria for the associated tariffs. This evaluation would lead to a phasing plan for the infrastructure elements, in a modular fashion. With regard to the alternatives evaluation in Figure 4, we believe it would be wise to give early consideration to possible adjustments in the service areas of the treatment plants to take advantage of economies of scale. Engineers and economists are both conscious of economy of scale issues, although they use different criteria and considerations. We would propose combining the criteria from both disciplines to formulate a range of alternatives with different degrees of regionalization. From an engineer’s perspective, an ideal service area boundary would respect both (1) governmental jurisdictions (i.e., provinces) (to match demographic data and provincial powers) and (2) hydrologic/topographic boundaries (shown in Figure 5) (to facilitate management of the water resources). With regard to the tariffs issue in Table 2, it is interesting to compare tariffs in Havana to those in Puerto Rico and in Miami-Dade County, Florida. In Havana, our source reports two sets of tariffs, one in U.S. dollars to hotels and embassies and another in Cuban pesos to the general residential population. While the currency exchange rate applicable to the latter is a matter of controversy, it does appear that the tariff is low relative to the other benchmarks and would need to increase significantly to finance the improvements needed to reach desirable levels of service and of environmental quality. According to the finanzas.com source mentioned earlier, the annual volume of water pumped in Havana is approximately 330 million cubic meters. If one were to assume for the sake of speculation that the tariff were to be eventually modified to, say, 1 U.S. dollar per cubic meter for the entire population, the potential revenue would be in excess of US $300 million per year. This number would be much greater than the reported US $ 8 million contributed to the venture by Agbar, which would appear at first glance to allow only operational improvements. Fortunately, regarding the tariffs issue, there are some lessons learned in other countries which may be profitably applied to Cuba, after duly adapting them to local circumstances. As shown in Figure 6, in the upper right-hand corner, the World Bank conducted a study of Eastern European and Central Asian countries that underwent political and economic transitions. The study noted that often there was a temporary decline in gross domestic product during such transitions, and this needs to be taken into account in the phasing in of tariffs to support infrastructure improvements. In some cases, temporary government subsidies to the poorer segments of the population are justifiable (World Bank, 2006). It seems to us that this issue of affordability needs to be well understood before undertaking any possible privatization efforts, to avoid contractual misunderstandings and adverse reactions by the population. As illustrated on the left-hand side of Figure 6, privatization has had mixed success in Latin America. In Puerto Rico, the privatization of operations of its utility, the Puerto Rico Aqueduct and Sewer Authority, was reversed, with the utility taking hold again of its operations and managing the system in a more efficient, decentralized manner, by geographic regions. For Latin America in general, the Inter-American Development Bank (2007) published a report analyzing the successes and failures of privatization. One of its conclusions was that the more solid the foundation work, in terms of pre-establishment of an independent regulatory agency and transparent procurement processes, the better the chances of a successful privatization. The water and wastewater infrastructure of Cuba is in need of repair and upgrades. Priority should be given to maintaining the continuity of the water supply and protection of source water quality. A considerable investment is needed to implement technologies to treat domestic and industrial wastewater prior to discharge to receiving water bodies. The existing water and wastewater infrastructure is in need of repair and expansion. The contamination of the existing environment is extensive, warranting dredging of sediments in some areas (Olivares-Rieumont et al. 2005). The necessary improvements to the water and wastewater infrastructure in Cuba, however, are not readily quantifiable. There is some institutional and economic information available, but not enough to allow a wellreasoned advisory role. Obviously, engineers and economists will need to collaborate closely on data collection and assessment. 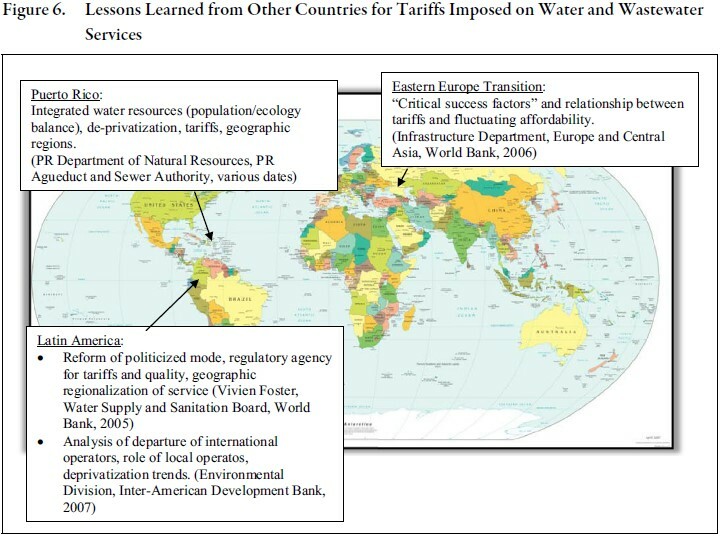 Lessons from other countries indicate that the longterm success of a water and wastewater utility, including efforts at privatization, requires a good institutional foundation: a national water policy and a regulatory agency independent of other governmental institutions (Belt and Velazquez, 2007). These are general guiding principles, but specific guidance would be best provided with the benefit of country-specific information, as discussed below. From an engineering perspective, the heart of the work required is the aforementioned gap assessment process, for both water and wastewater. Unfortunately, the amount of hydrologic and engineering data available to conduct such assessments islandwide is very sparse. For Havana, the amount of data is somewhat better, although still very lacking. It is conceivable that with additional research, a gap assessment (albeit a very preliminary and incomplete one) might be possible for Havana. It may be reasonable to focus on new supplementary treatment facilities for water and wastewater, because an assessment of collection and transmission networks would require in-situ condition information that is not readily available. This initial effort could then serve as a pilot study for similar studies in other parts of the country. In the next few months, our committee will focus on Havana and conduct further research of available sources, including personal knowledge of recently-arrived Cuban engineers who worked in the sector. From an economics standpoint, there is a strong role for economists in several portions of engineering gap assessments, as noted earlier. In the next few months, this committee will engage economists from ASCE and/or from academic institutions in South Florida to begin work on these elements. The authors hereby extend a cordial invitation to economists to work together with us on these challenging and interesting issues. 1. The opinions expressed in this document are those of the authors and do not necessarily represent the views of their employers or of their sponsoring engineering societies. Authors’ knowledge of Cuba is based on limited information available mostly on the Internet. The authors would like to acknowledge the valuable advice received from Juan Belt and Luis Velazquez of the U.S. Agency for International Development; as well as information received from Professor Manuel Cereijo (University of Miami) and Teo Babún (Babun Group), and technical assistance from the University of Miami Libraries staff and from the technical and graphics staff of Camp Dresser & McKee Inc. We also appreciate the support received from University of Miami students including Cristina Ortega, Reshma Ramoutar, and Karen Kajder and several members of our Water/Wastewater Infrastructure Subcommittee, notably Rafael Robayna, Jose González and Victor Pujals.